April 4, 2009: Beach Excursion! Yesterday I went on a beach excursion with my program. 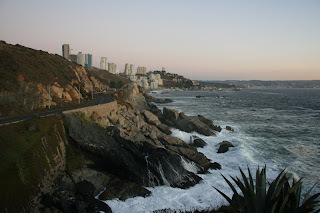 All of the places were just a little north of where I live in Viña del Mar. 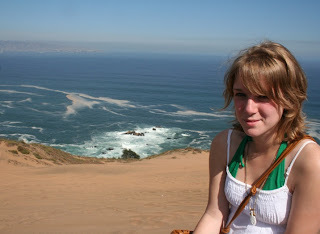 We first went to ConCón, where we climbed sand dunes and burned our feet in the sand doing so. It was worth it once we reached the top as the view was spectacular! Traveling by bus, we then visited the small town of fisherman and artisans, Horcón. Here we had only (I felt) a minimal amount of time to scarf down some fried seafood and cheese empanadas (I had a shrimp & cheese-best empanada yet!) and to explore the beautiful beach where the fresh fish are caught. After being herded back to our bus (typical routine with a 50+ gringo invasion), we were off to Zapallar. At Zappallar we had two hours to lay on the beach and it was glorious. Zapallar was nearly the equivalency of Hollywood or Beverly Hills, with giant houses that overlooked the beach owned by the wealthy. 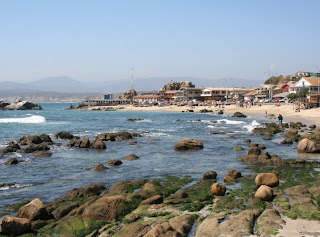 We forgot for a while that we were in Chile… After Zapallar, we headed back towards Viña. 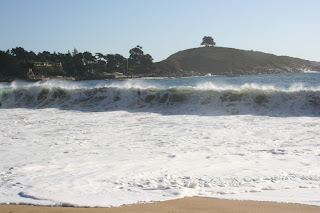 We stopped off at Roca Oceánica near Reñaca. 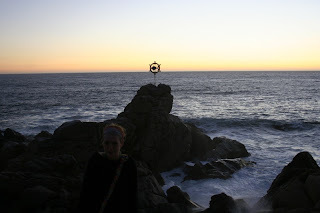 We were able to see the sun set as we stood on the giant cliffs of rocks that overlooked the ocean. Oh, what a beautiful day it was!